According to the World Economic Forum's Gender Gap Index (2009), India ranks 24th out of 135 countries in regards to women's political participation. In the world's largest democracy, women still hold a mere 10% of seats in India's Parliament. Yet at the same time, the struggle to enact the Women’s Reservation Bill, which would allot 33% of seats in state legislatures and parliament for women, continues. As of today, the passage of this bill is close to becoming a reality. Although women politicians will continue to face different barriers and certain disadvantages before and after taking political office, it is imperative that they are able to receive sufficient training and knowledge with which to prepare them for greater political involvement. Women who aspire towards becoming effective politicians in India must acquire specialised knowledge and experience in order to win elections and pursue inclusive policies at the local, state and national levels. The India-Women in Leadership (i-WIL) programme provides women with the knowledge, skills and tools essential for becoming a leader in India’s shifting political landscape. The Centre for Public Policy (CPP) in collaboration with New Delhi-based Centre for Social Research (CSR) launched India’s first certificate course in political leadership for women—the India-Women in Leadership (i-WIL) Programme. The i-WIL Programme is an endeavour to strengthen the capabilities and leadership skills of aspiring women politicians to contest elections and participate in governance. The i-WIL programme was inaugurated on 16 July, 2012 by Her Excellency, Smt. Margaret Alva, Governor of Rajasthan. 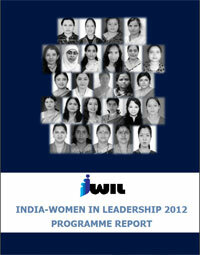 26 women (see Annexure 1) from different walks of life representing 10 states across India enrolled for this programme. United Nations Women (UN Women), United Nations Development Programme (UNDP), Government of Karnataka, Kiran Mazumdar Shaw, Jawaharlal Nehru University (JNU), Global Studies Programme and Takshashila Institute extended their support in different ways. The course was spread over three months and included lectures, field visits, and exposure visits to Delhi and Singapore.